This is a very nice boat, still in great condition. I've actually done a good bit of maintenance work on it recently to keep it running well. I had the alternator rebuilt, I changed the belts, fuel/water separator/ filter, spark plugs, oil and oil filter, put a new bilge pump in it, and remade the center floor boards and supports. 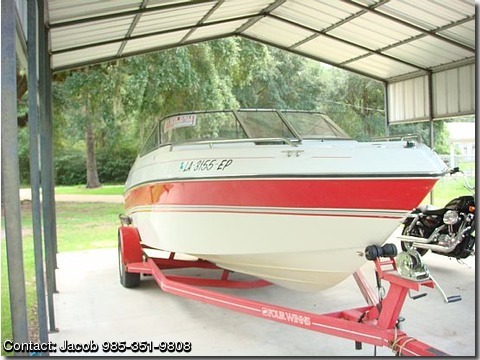 Like I said, it's a great boat that I hate to get rid of, but I must because I am going back to college and the payments are kind of tough to afford when I can't work full time. But anyway, just give me a call or send me an email if you have any questions, and I thank you for your time.